"Let justice surge like waters"
I will not listen to them. We care for victims of abuse in our midst, whether their pain was caused by those in the Church or elsewhere. We listen to their needs, their demands, their requests and we help them find some measure of justice and healing. We do not pursue our own self-interest, but their best interest--not as we see it, but as they do. We start with what we can control, ourselves and our own communities. We build up the Kingdom where we can. We, the lower clergy, parish priests and deacons, resolve to live the Gospel in simple, authentic, and radical ways. No more Pharisees, only followers of Christ. We, the laity, take on a larger role in the governance of our parishes and our dioceses. We make noise that the bishops and the Vatican cannot ignore, we demand justice, reform, and renewal on the terms of the People of God. Today is the feast of the Passion of John the Baptist, a stark reminder that the path of justice righteousness is not an easy one and does not always bring with it comfort and serenity. John the Baptist, the final and greatest prophet, did not seek to renew the world through politics, power, or public relations, but by radically relying on the Holy Spirit and following the dangerous paths the Lord laid out for him without fail. May God be with us and may "justice surge like waters, righteousness like an unfailing stream." "Rise up, Lord, in your anger"
As pastor of this parish I feel it is my responsibility to speak to you in this moment. I recognize that this is a difficult time as many of you may have relationships with the victims, with the perpetrators, or you may be a victim of abuse yourself, but I would like to speak with you frankly about my own thoughts, as the time for polite obfuscation is clearly behind us. I was a senior in high school when the Boston Globe first broke its story about clergy abuse in 2002, so by the time I was ordained a priest in 2012 I was aware (as we all have been over these last 20 years) of the issues of child abuse that have plagued us and came into a church that had already enacted many measures to keep its children safe. As a young priest ordained post-scandal I probably had a naïve vision about what my role could be in the church--about how I would have the opportunity, like some kind of Old Testament prophet, to over time transform and help guide the church to a better place little by little. I now know that I, like many of us, was naïve. Now, this does not mean that I believe Bishop Bambera is wrong about the work we have done in protecting children, I think he is correct about that. Even a single case of abuse is too many and our work in stopping child abuse can never end, but any of our volunteers or parents would most likely be able to testify to the great work that has been done by the people of this and other parishes in ensuring the safety of our children. My naiveté did not have to do with our capacity to end abuse, but with our ability to abolish the structures that allow this sort of thing to happen--these terrible crimes, structures that allow for the lack of accountability and oversight. We need reform--real, legitimate, intense reform. It is clear now that for that to happen we will have to rely on you, the People of God. I say this to you not because I believe I have all of the answers, but precisely because I know that I do not and that if we desire to serve God truly we must be honest with one another and resolve work together, that there will be no knights-in-shining-armor in this story, only a faithful and dedicated group of people seeking to shine the light of God even when the shadows loom. I do not want to give you the impression that there is no hope, there is always hope--hope for victims, hope for all of us. There are good people in the world, good people in the pews, there are good priests, there are good bishops. To all of those good people now is the time for actions, not words--actions on behalf of the victims, actions that will reform and heal the Body of Christ. The true work of reform, guided by the Holy Spirit, will lead us down a difficult and sometimes lonely path, but when we walk with God down that path, God walks with us. Thank you, please remember to pray and care for the victims of abuse, and may God bless you. A few years ago former Yankees manager and current Major League Baseball executive Joe Torre sent a letter to baseball players and managers re-emphasizing an old piece of baseball etiquette--"don't argue about balls and strikes with the umpire!" 1.) The game of baseball, like most sports, only works when the umpire's authority to officiate and arbitrate disputes during the game is recognized--umpires, referees, and officials are necessary to keep things running smoothly. 2.) While there are written rules and ideal parameters and a strike zone can be enforced unevenly, ultimately if an umpire calls something a strike it is a strike, if for no other reason than because (s)he said it was. 3.) The umpire is unbiased, knowledgeable, and has been entrusted with the task of determining whether a pitch is a ball or a strike, the batter/pitcher/manager/fan has not been so entrusted. At this point you might be saying "what a strange digression, Father, what does that have to do with the pope, St. Irenaeus, or Peter and Paul?" Well, we live in an era when criticism of the Bishop of Rome (the Pope) is at an all time high. Otherwise faithful priests, laypersons, Catholic periodicals, certain prominent Catholic television stations, and even a cardinal or two criticize everything that comes out of Pope Francis' mouth almost as a matter of course. Now, this isn't terribly unusual, nor is it usually all that problematic, at least from an ecclesial point of view (though it may be from an individual spiritual point of view), after all the Pope is not perfect nor is he always infallible in everything that he says. What presents a problem is when a purported Catholic accuses the pope of saying or promoting something heretical, unorthodox, or rejects any form of obedience to the pope in his role as Vicar of Christ. It is this type of accusation that being a Catholic takes off of the table, the office of the Papacy is necessary and exists precisely because it is prevented by the Holy Spirit from uttering heretical or unorthodox formulations of the faith. This is distinct from the ability of the Church of Rome, under certain circumstances, to make positive infallible statements, it is more akin to making the Pope the "referee" of Christian theology, the one with the supernatural authority to determine if something is a theological "ball or strike". Let's look for a minute at these two feasts we are in the midst of celebrating--St. Irenaeus and Ss. Peter and Paul. St. Irenaeus is one of our earliest theologians who lived during the second century in Lyons, France. He is most famous for a letter that he wrote entitled Adversus Haereses (Against Heresies). In Adversus Haereses Irenaeus is arguing against the Gnostics--a group of early Christians who claim to have secret knowledge about the teachings of Jesus that the rest of the Church isn't privy to, has forgotten, or is ignoring. Irenaeus says that he doesn't even need to debate the content of Gnostic teaching because he knows right away it isn't legitimate. Why? Because it doesn't come from the Apostles. The way this whole things works, according to Irenaeus, is that Christians can be confident as to what is the authentic teaching of Jesus based on what is passed down from the Apostles to the bishops. If you have no connection to the Apostles, then you do not have the authentic faith. This apostolic guarantee of orthodox Christianity is even more pronounced and obvious when it comes to the Church of Rome. The Church in Rome was founded by the two greatest of the apostles--Peter and Paul. Because of the holiness and the witness of the Church of Rome and because of the promises that Jesus made to St. Peter we know that the bishop of Rome (St. Peter's successor) can never lead us astray. Now, if you're not Catholic you may not have been convinced by this, but if you are Catholic it is absolutely fundamental to the very structure of our Church and our belief in Apostolic Succession. Irenaeus refutes the Gnostics not primarily because of the content of their teaching, but because their teaching does not come from the Apostles and their successors, namely the successor to the Apostles in Rome. I feel as though it is important at this moment to reaffirm this basic and foundational part of our Faith. Think of Pope Francis as the theological umpire who is supernaturally prevented from completely misjudging balls and strikes. It is inappropriate to accuse the Pope of heresy, heterodoxy, or refuse him theological obedience in principle, regardless of the content of what he is saying, because for a Catholic what he is saying is specifically prevented by God from being heresy, heterodoxy, or unworthy of obedience. We have had bad, immoral, licentious popes. We have had popes who have made poor decisions in their personal lives and in the governance of the Church. We have had popes who may have even believed and in private correspondence espoused heretical beliefs. But we have never had a pope who has taught at even the lowest level of magisterial authority something heretical--because he cannot. To make such a claim against the Bishop of Rome: 1.) disrupts the very life of the Church; 2.) is, as we have seen, not even a theological possibility for a Catholic; 3.) represents an overstepping of boundaries for a priest, layperson, periodical, television station, or even cardinal. Now I have disliked things that popes have said or done, I have disagreed with their decisions, and I have even thought their statements on reformable theological issues incorrect--but it would be a contradiction of Catholic teaching for me to claim that a pope has taught heresy, heterodoxy, or that he was unworthy of my theological obedience. I have never, nor do I now, possess a particularly exaggerated vision of the Bishop of Rome's theological role in the Church. Throughout history Popes have not been the only source of theology, nor usually even the best source, but they ARE the safest and most secure source, a source which we can be confident at least isn't contrary to our teaching and our Tradition. In other words, if you disagree with Pope Francis, fine, but if you find yourself questioning the orthodoxy of Pope Francis' teaching either your understanding of orthodox Catholic teaching is wrong or you are not in fact Catholic. We can debate and disagree about most things, but this is a line that simply cannot be crossed. We don't have to love every call he makes, but PLEASE, stop arguing balls and strikes with the umpire, it's not how the game is played. We live in a results-oriented world. A dog-eat-dog world. A what-have-you-done-for-me-lately world. A what's-in-it-for-me world. A world that is quick to judge, quick to condemn, but slow to forgive, slow to encourage. Into that world today steps St. Barnabas, nicknamed by St. Luke "the Son of Encouragement". In scripture we first meet Barnabas as an advocate of gentile (non-Jewish) Christians--a voice for the new, different, and sometimes looked-down-upon members of the Church. It is in this capacity that Barnabas seeks out and supports St. Paul, the one-time persecutor of the early Church, and becomes a long-time missionary co-worker of the great saint. Barnabas vouches for Paul's conversion and, thankfully for the history of Christianity, convinces the other disciples to give him another chance. 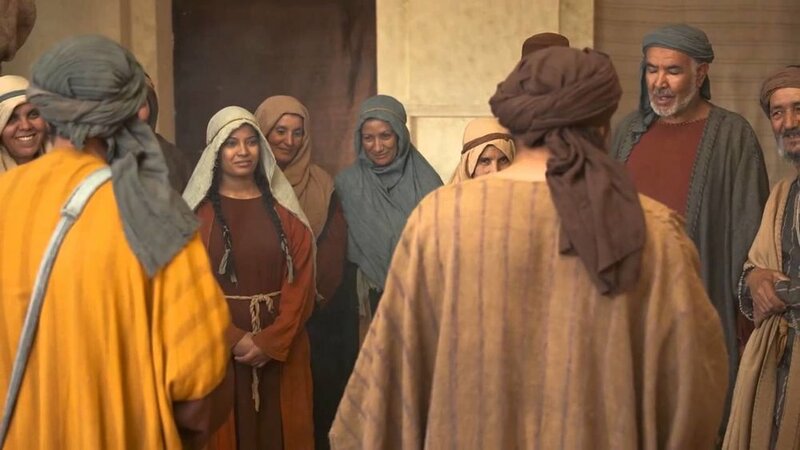 We see something of a repeat of this story later on, this time with Barnabas supporting the evangelist [John] Mark, a failed missionary companion of Paul, and insisting that Paul give him another chance to accompany him and preach the Gospel. Paul refuses, leading to a sad rift between the two, one that is never healed. To the credit of both men they never accuse one another of heresy or sin, they simply end their professional relationship. After his split with Paul we do not hear from Barnabas again in scripture but one can assume, partially because the gospel that Barnabas new co-worker, Mark, writes becomes part of the scriptural canon, that St. Barnabas goes on to do great things in service of Christ. As we seek to do and accomplish things, even good things, even great things in service of the Gospel, we should never forget our duty to people. The Gospel is ultimately about serving and proclaiming the Good News to people, it does us no good to alienate and condemn even those who have made mistakes as we seek to follow Christ. Don't miss the opportunity to give someone a second chance, to stand up for the condemned as you try to accomplish your mission. We will have disagreements, we will have arguments, we will have divisions even on the most noble of endeavors. These disagreements may not always end in an easy reconciliation, but they don't have to end in vitriol and hatred, either. Barnabas and Paul found themselves unable to work together, but they did not descend into base accusations, name-calling, and subterfuge. We can fall to the temptation of destroying the reputation and confidence of people after we have personal or professional disagreements with them, this is unnecessary and unchristian. Take a look at Acts of the Apostles some day, you will be surprised at the relevant and powerful lessons you can find in the relationships described within. St. Barnabas, the Son of Encouragement, is a witness to the importance of not allowing our drive and our sense of mission to allow us to bowl people over in it's wake. To take the time to advocate for those who are cast-down and practice charity even when complete reconciliation is impossible. St. Barnabus the Son of Encouragement, pray for us! What comes to mind when you think of the Blessed Virgin Mary? I think sometimes we place ourselves in a box when we reflect on the Mother of Christ. We can run the risk of thinking of her as a statue, as a holy, quiet, pious woman who bears the Son of God in her womb for nine months and then retreats into the background. The reality is that Mary has her own theological and social contribution to make, one that is, frankly, among the most radical and provocative in all of scripture. Today we celebrate the feast of her Visitation to her cousin Elizabeth, the visit in which she echoes the words of Hannah, the mother of Samuel, in her famous Magnificat. Mary's Magnificat is a powerful and stirring call to make Christ felt in our world, it is a call to social change, to radical discipleship, to bringing about the Kingdom of God here and now--it tells us in real terms the difference that Christ's incarnation makes. Mary is not a silent figure, she is an agent of change in our world, a prophetess, the first and most committed disciple of Jesus. Take seriously her Magnificat and allow her words to seep into your soul and motivate you to go out into the world and build up the Kingdom. I. Can a physician when invited by duelists assist at a duel with the intention of bringing an end to the fight more quickly, or simply to bind and cure wounds, without incurring the excommunication reserved simply to the Highest Pontiff? II. Can he at least, without being present at the duel, stay at a neighboring house or in a place nearby, ready to offer his service, if the duelists have need of it. III. What about a confessor under the same conditions? To I, he cannot, and excommunication is incurred. To II and III, that, insofar as it takes place as described, he cannot, and likewise excommunication is incurred. So have a happy new year and try not to go to any duels in 2018, especially if you're a priest or a doctor! With the winter weather quickly and seemingly out of nowhere descending upon us it might be nice to spend a minute reflecting on a sunnier topic! This past Monday evening at OLMC we watched part three of Bishop Robert Barron's Catholicism Series and during the video Bishop Barron discussed briefly Georges Seurat's pointillist masterpiece A Sunday Afternoon on the Island of La Grande Jatte (take a look at the painting below). If you were to go to see the original work at the Art Institute of Chicago you would notice that, like other pointillist works, the painting is magnificent from a distance but a bit confusing from up close. Pointillism involves small distinct dots of color arranged in a larger pattern and the result is a painting that up close seems to be a random assortment of multi-colored points but at a distance displays an image or scene. This genre of painting can, in many ways, be used as an analogy for our everyday lives and the presence of God in the world. So often as we go through our days the things that happen around us seem random, unimportant, or difficult to accept. It is only when we step back and look at the world and our lives as a whole that we can see what is happening and where God is at work. Don't be discouraged if you struggle finding God in this or that event or circumstance in your life, sometimes we need to see the whole picture to find and experience his presence and his Providence. I always thought that today's feast, The Dedication of the Lateran Basilica, was a strange one, why such a big deal about a single solitary church? I felt that way, that is, until I enrolled just next door at the Pontifical Lateran University, one of my almae matres. It was then that I was able, every day, to spend a little time praying in this magnificent church. First of all, it is not simply called "The Lateran", instead the official title is " Major Papal, Patriarchal and Roman Archbasilica Cathedral of the Most Holy Savior and Saints John the Baptist and the Evangelist in Lateran, Mother and Head of All Churches in Rome and in the World "...quite a mouthful. 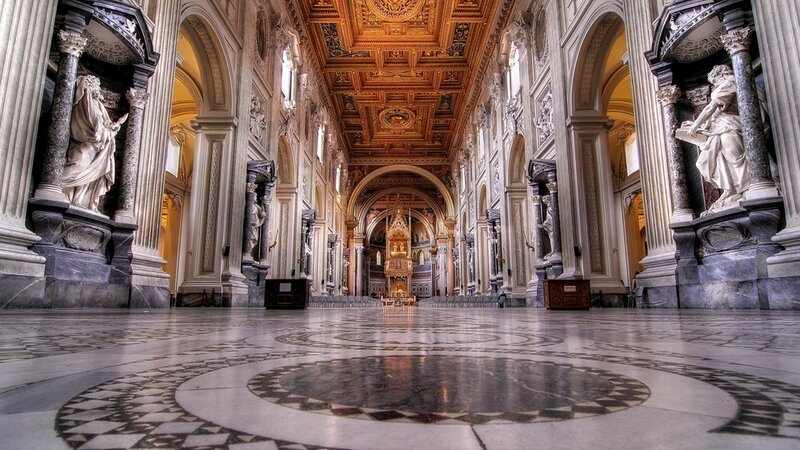 The Lateran, not St. Peter's, serves as the cathedral of the Diocese of Rome and the Pope's church and it is alive with the history of western civilization. As you enter the Lateran you walk through a set of massive bronze doors, the original doors of the Roman Senate, and once through the doors you will notice ancient columns that were once located in Trajan's Forum. As you gaze on the work of some of the greatest architects and artists in history, men like Borromini and Galilei your eyes are immediately drawn to the massive statues of the twelves apostles that flank the nave of the basilica, each holding the instrument of their martyrdom (definitely notable is St. Bartholomew--holding his own skin!). Throughout the church you'll find countless religious and historical relics from the bones of Ss. Peter and Paul to the bronze that once adorned the Temple of Jupiter and before that Cleopatra's fleet decorating the tabernacle. When you reach the apse of the cathedral you find the chair. When the pope teaches something infallibly we say that he speaks ex cathedra (from the chair)...this is that chair. A remarkable testament to the centrality of this cathedral from the very earliest days of Christianity. What can you learn from the Cathedral Archbasilica of the Most Holy Savior and Ss. John the Baptist and Evangelist in Lateran? You learn that the church is universal, both in terms of geography and in terms of history. The Church exists on every continent, where billions of Catholics pray the same prayers and make up the same Body of Christ. The Church has also existed for 2,000 years (and in a certain sense, longer) and has been the home to countless sinners and saints, artists, scientists, and leaders. It is on this feast that we celebrate the universality of our church that is so beautifully expressed in the mother and head of all churches, the Pope's cathedral. Losing a loved one--a spouse, a child, a parent, a sibling, a friend--is, in most cases, the most difficult thing that any of us will go through in our lives. It follows, then, that accompanying those we love through the process of mourning a death is one of the most important things that any of us will do in our lives. As recent news stories have indicated, helping a friend or loved one cope with death can be very intimidating and many of us struggle determining what is the appropriate thing to say or do. Sometimes it seems easier simply to avoid death altogether and resist putting ourselves in situations about which we are unsure or uncomfortable. Our faith, of course, urges us to do the opposite. Not only do three of the Church's works of mercy (burying the dead, praying for the dead, and comforting the sorrowful) urge us to accompany others on the funeral journey, but scripture tells us of Jesus himself accompanying those who mourn from Mary and Martha to Jairus. Perhaps news of the president's interacting with the grieving widow of a soldier can serve as a reminder to all of us of the importance of being present for those in our lives who are mourning. People aren't looking for us to explain why their loved one has died, they are not looking for us to take away all of their pain, and they are not looking for someone to provide them with all of the answers. Our loved ones, friends, and acquaintances are, above all looking for the people in their life to accompany them, to be present to them, and to listen. Even in the short time since I have been ordained a priest I have noticed a decline in the number of people who attend viewings and funerals and I imagine that this is due in part to the level of discomfort and uncertainty people feel around death. Please, do not allow your discomfort to get the best of you! It is so critically important that we continue to bury those who have died, to pray for them and their families, and to comfort our brothers and sisters as they mourn. You don't need to have all the answers, you simply need to be present--it is one of the most important ways we can follow the example of Christ in our lives and be Christ for those in need.